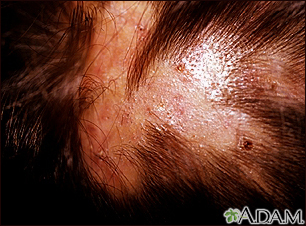 Folliculitis, decalvans causes scarring with hair loss (alopecia). There are areas of "corn stalking" (grouped hairs arising within the area of alopecia), redness (erythema), crusting, and pustules. Due to severe scarring, permanent hair loss occurs in the involved sites.